Flu season is approaching! After last year’s monster flu, we in the medical world are focused on prevention this year. So we’re urging everyone eligible (age 6 months and older) to get the flu shot. While most of my patients storm the office doors to get their flu shot, some are a little more lax about it. I thought I’d share some of my more recent discussions about the flu shot to clear up any confusion or misconceptions. Hopefully, but maybe not. The flu kills healthy children every year. Last flu season (2017-2018) a record 172 American children and teens diedfrom the flu, half of whom were previously healthy! Unfortunately, no. But your chance of getting a severe case is much less. 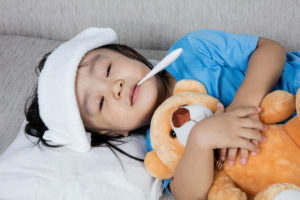 The flu is a nuisance: the kids feel awful, often the whole family gets it consecutively, not to mention all the missed days of school and work. But what we’re really trying to prevent is the complications associated with the flu. Every flu season, both healthy and chronically ill children are hospitalized, sometimes in the intensive care unit. A study published in 2017 showed that the flu shot reduced the rate of flu-associated death by 65%in healthy children! This is big news! No. You can’t get the flu from the flu shot. You canpick up a flu-like illness around the same time in school, on your way into the Dr’s office, or from the shopping cart at the grocery store that you stop at on your way home. Get my point? Coincidence. And with any vaccine, there’s always the slight chance of side effects such as a day or two of body aches and weakness. Your children’s immune system is working all day every day. Every time they put their hands into their mouth, chew on a pencil, touch a public doorknob, get sneezed on by a classmate, or play at the playground/library/kid’s gym they are being exposed to thousands of germs. Most are fought off quite effectively. Occasionally one little bugger sneaks past and your little one ends up with strep, coxsackie, a cold, etc. The flu is not something to leave to chance. Insert trumpet sound…The nasal mist is back! The scientists have revamped it by adding another strain to improve its effectiveness. It’s now recommended equally to the injectable form. However, there are a few more restrictions on who can get the nasal mist (for example, under 2 years old and 2-4 year old wheezers should not) so talk to your doctor before promising your kids that they won’t be getting the shot. I’ve witnessed that downward spiral one too many times. She’s too young for the flu shot. Flu shots are recommended for ages 6 months and up. But, if all household members and caregivers get the flu shot, you’re protecting her indirectly. It’s called herd immunity. Well, not exactly. It depends on the allergy symptoms you have. If you test positive to egg allergy, but can eat cooked eggs, you can get the flu shot! If you get hives when you eat eggs, you can get the flu shot! If you have more severe symptoms, you, too, can get the flu shot! However, for those with more severe symptoms, it’s recommended you get your flu shot in a health care provider’s office that is capable of recognizing and managing severe reactions, just in case. Flu vaccines are not just for kids. Let your kids see you get vaccinated! Show them how a tiny pinch or a nasal mist is no big deal, especially when compared to the misery the flu can cause. Keeping your home flu-free this year is the goal. Prevention goes a long way!